Alright, so lately everyone in the entire world has been listening to me raving about Julian Anderson's The Phoenix at Megalong Valley, but after investing 10 hours cleaning the crack, and another 4 or so on working on a new access route (via the top, at Medlow Bath) I finally got around to leading it today, and dragged along No-Chalk Rob for the ride. The Phoenix is a 45m grade 20 trad climb (best done as 1 long pitch). With an amazingly sustained finger-crack section, as well as some (easy) off-width, stemming corner, and a funky finish, I genuinely believe there is nothing quite like it in the Blueys. 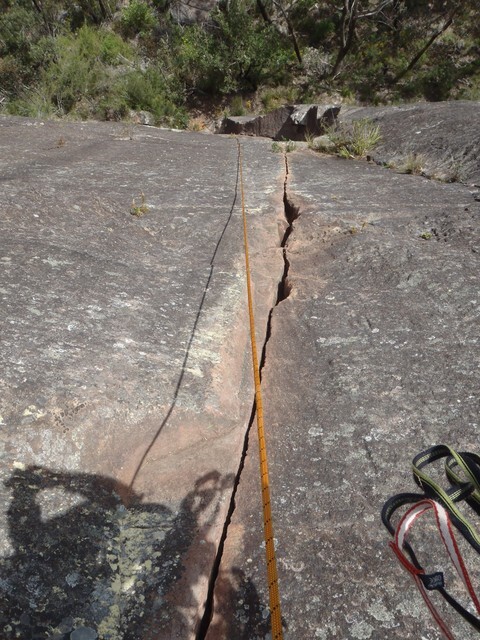 Below is a photo of the unique (to the Blue Mountains at least) finger-crack section the day I finished cleaning it. Here I am making the climb look way harder than it is... The fingerlocks are bloody awesome. The climb EATS small cams (0.3 and 0.4 BD). Here is No-Chalk Rob making the finger-crack look infinitely more stylish. No-Chalk Rob contemplating the exciting finish. After Rob finished his own successful lead on it, he had to run, so I rope-solo'd my way back to the top to pick up Rob's gear. The below photo is best taken as context for the climb in it's entirety. Nice work, Paul. Hopefully I'll be able to get on when I finally visit the Blueys. It looks like an awesome pitch and should get lots of traffic now that you've cleaned it up. Trad is rad, having climbed this a couple of years ago I remember how good this climb is, well worth the effort so don't put off climbing it. It's great for summer morning (I think Paul said sun hits the wall around 12) or winter arvos. I agree, this climb is very good, well worth the effort in my opinion. Thanks for putting in all the effort of late paul. I don't know about me looking stylish though paul, climbing finger cracks is a definate weakness of mine! If you're like me and have bugger all climbing endurance, don't let that deter you; it's slightly slabby, not at all pumpy for the grade.... Get on it! Did this a few years back. It was a good climb and probably in need of a clean after the few wet years we've had. >in the mountains. Solomon and Kaladan would be the 2 that spring to mind. Go to the Wolgan and jump on the Sizzler. Grade 19 with Beaut hand jamBing and fists.....if you haven't done Interstate 31 at cosmic county grade 17 or Psycopath at piddo grade 18 then get on em!!! Classic hand cracks! 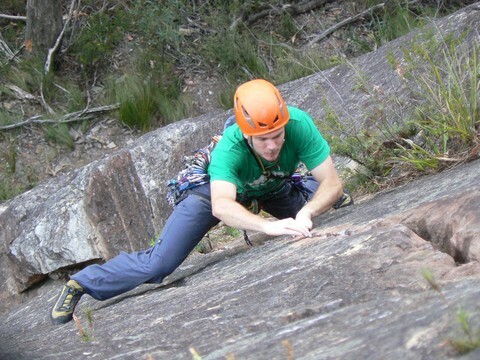 !.......There is also First Year Uni at Mt York a short grade 19 hand crack. Done those. Seems like "20" is where the feet give out a bit or there are less cheating options like layback or face holds. Is cosmed wide hands? though sounds too short to be in the class of the other 2. Is Cosmed the route halfway along to the end of Cosmic? There's a short gr20 in there which Mikl's select guide called "token crack, a 30mm number". Anyway, if that's the one it's very short, quite good, not too hard, and definitely not hands......more like finger stacking. Isn't there one at Pierce's? Samson gets a #1? I haven't done it. Just go to the Point. Icebird, Windjammer, Fantini's 20 in the middle of the wall (starting up Monty's 24), and especially Bad Luck Streak (on the Rex Hunt wall), all have fantastic hand crack sections at around gr20. Cosmed (20) at The County is off-fingers... Purple cam. Pretty short, and kinda sequency. Not really hard. When Jenga climbed it, he decided that he was gonna take inspiration from a certain someone on this forum, and "Face climb the $#!t out of the crack!" First Year Uni (19) is short but sweet. I found it really hard when I first did it, but subsequent repeats have made it feel easy. You already mentioned Kaladan... I haven't done Solomon... But what about the 2nd pitch of Clockwork Orange. That's some pretty demanding handjamming, and I think it was about a #2. Probably a bit of a weird one... But Haystack Madness (20) at Bardens is a laugh at the grade. You don't HAVE to jam the start of it, but I'd argue that it makes it to the grade... Climbing it like a sport route probably would make it a harder grade. Mark Wilson was advocating Sampson Gets a #1 (20) when I spoke to him a while ago... He seemed to think that it was one of the better handcrack routes at the grade. Ah, but I have "dogs" on Kaladan and Solomon and for some reason having a big day doing 3 handcracks in the Blueys appeals to the sadomasochistic element in my nature . Better if it is freezing and rains. Will get climbing partners to throw rocks at the same time! Ben Lomond could be the ultimate in hand jamming suffering but one 3 pitch route would be more than enough. Vague recollection of seconding Samson gets a number one, and I think you are right, it could be a good third route! I could start on the 16s at Frog and face my weakness (Materialistic Prostitution springs to mind). Epic Journey was far easier, though 7 grades harder! Great job - especially putting in a rap! Was there about 5 years ago - spent more time bashing over the non-existent track than we did climbing! that used to be what you did before lunch in olden times!! 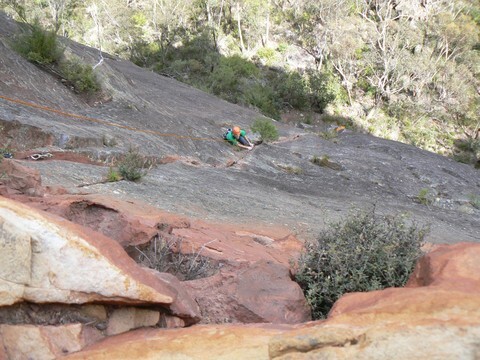 The best grd 20 crack I have climbed in the Blueys is at Odin Head in Mt Vic (Mt Wilson Topo) , it is called sleipnir, 35 mtrs one long pitch of clean continuous crack to top. There is a nice 22 splitter also to the right but considerably headier lead ( +pure jamming out of roofs etc.) Sleipnir will have you drooling, when you see it you will know your there. No track so good Nav practice. >Sleipnir will have you drooling, when you see it you will know your there. >No track so good Nav practice. Good effort guys. Can't wait to check it out. If you don't love jamming, you don't love yourself. Wonder if many people have got onto Colloseum Corner at Sublime Point (75m, 19). As you describe for this route, it's got some great fingers, delicate stemming and a couple of surprise offwidths higher up (that would have taken Cams 5 and 6 if only I'd brought them! luckily found an acceptable chicken head and later a groove for small ball-nut). Only catch is a lot of grass and choss in the 'interesting bits.' I'm tempted to go back and to the gardening job you guys have done, because it is a stellar line. But hopefully if some more of you get on it there will be less work to do! P1 of Colloseum Corner is in great condition, and gets done fairly regularly. Most people bail after the first 30m or so. Are the top sections really that worthwhile? I haven't done it yet, cause I got distracted by Guillotine last time I was out there.